The northern sky’s two most prominent sky patterns – the constellation Cassiopeia the Queen and the Big Dipper – both circle around Polaris, the North Star, once a day. They are opposite each other – one on either side of the North Star. The constellation Cassiopeia the Queen is easy to recognize in the northern sky, either in the evening or before dawn. 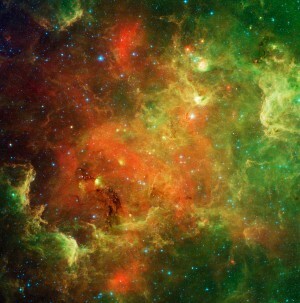 This constellation is shaped like a W or M and contains five moderately bright stars. The distinctive shape of Cassiopeia makes her very noticeable among the stars of the northern sky. Of course, Ursa Major, the Greater Bear – which contains the Big Dipper asterism – is one of the most famous of all star patterns. 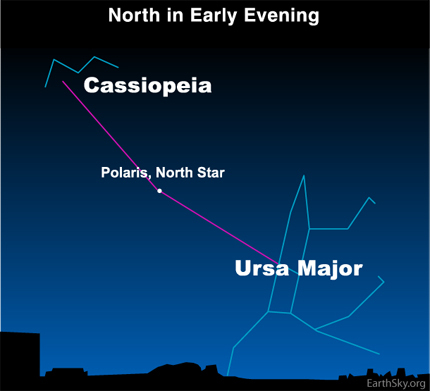 At nightfall this month, Cassiopeia shines high in the north while the Dipper lurks low. They are always on opposite sides of the North Star. From the southern half of the U.S., the Big Dipper is actually partially or totally beneath the horizon this month in the evening hours. North of about 40 degrees north latitude (the latitude of Denver, Colorado), the Big Dipper always stays above the horizon. Nonetheless, the Big Dipper’s proximity to the horizon may cause haze low in the sky or obstructions close to the horizon to obscure these stars in the evening at this time of year. That will change as night passes, as the great carousel of stars wheels westward (counter-clockwise) around Polaris, the North Star. Polaris resides halfway between Cassiopeia and the Big Dipper, so these two star formations are like riders on opposite sides of a Ferris wheel. Looking northward, they rotate counter-clockwise around Polaris – the star that marks the sky’s north pole – once a day. Approximately every 12 hours, as Earth spins beneath the heavens, Cassiopeia and the Big Dipper trade places in the sky. Thus, around 11 p.m. tonight, Cassiopeia circles directly west (left) of Polaris, whereas the Big Dipper sweeps to Polaris’ east (right). Before dawn tomorrow, the Big Dipper climbs right above the North Star, while Cassiopeia swings directly below. Watch the celestial clock and its two great big hour hands – Cassiopeia and the Big Dipper – as they swing around the North Star every night!